Tun V.T. Sambanthan stepped in to lead the Malayan Indian Congress at a crucial period in the party's development as the independence movement began to gather pace. VEERASAMY Thirunyana Sambanthan, better known as Tun V.T. Sambanthan, was one of the leading Indian leaders who played a prominent role in the independence movement in Malaya. As president of the Malayan Indian Congress (MIC) during this important period of transition, he worked closely with Alliance Party leader Tunku Abdul Rahman and they developed a close personal bond. The entry of the MIC into the multi-communal Alliance in 1955 contributed greatly to enhancing the coalition’s image as the main representative of the three main communities in Malaya. MIC’s Alliance membership provided additional electoral strength to the coalition, convinced the British of increasing evidence of inter-communal co-operation and, more importantly, allowed for more representative negotiations that led to the formulation of a new Constitution. First Prime Minister Tunku Abdul Rahman described Sambanthan as a “lovable character, gentle and very easy-going”. Despite the apparent soft outward appearance, Sambanthan was a tough politician and negotiator. He took over the mantle of the MIC during a period of turmoil in the party in 1955, barely months before the first federal elections, and over time strengthen the party and consolidated its position in the coalition. He did not always please his members, but was able to gradually unite a party that had considerable internal splits. In 1954, there were serious debates within the MIC as to whether the party should join the Umno-MCA Alliance that was emerging as the leading political movement in the country, following their successes in local elections. The MIC had aligned itself with Datuk Onn Jaafar’s Independence of Malaya Party and later Party Negara, and there was a rethink within the MIC leadership during this period. 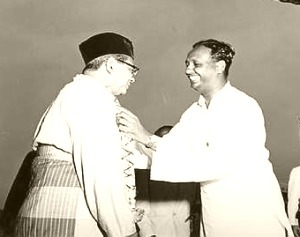 According to Rajeswary Ampalavanar (author of The Indian Minority and Political Change in Malaya 1954-1957), the MIC leadership was quite eager to join the Alliance but there was some resistance within the party’s broader membership. They were willing to support the move if the party could secure some concessions from the Alliance on inter-communal issues, particularly on education. Some in the party felt that there was a need for a leader with a stronger relationship with the party’s grassroots. In March 1955, reports in the local daily Tamil Murasu urged Tamils to boycott the MIC. Sambanthan, then a state MIC leader, emerged during this period as an alternative candidate for the party leadership. Going by historical records, he was literally coerced into taking up the presidency. Another candidate, P.P. Narayanan, was approached by party leaders but turned down their invitation because he wanted to concentrate on union activities. Sambanthan initially declined but following some pressure from the Tamil leaders agreed to take on the party leadership. He was duly elected the fifth president of the MIC in May 1955. The year 1955 was a milestone for Malaya’s advance towards self-governance. The British colonial administration had agreed to hold the first federal elections in July 1955 and Sambanthan was instantly thrown into the cauldron of electoral politics. He met the new challenge and following negotiations with the Alliance leaders the MIC was allocated two seats – in Batu Pahat, Johor, and Sungai Siput, Perak. Sambanthan contested the Sungai Siput seat and won comfortably. The Alliance swept 51 of the 52 seats, the exception being a seat in Perak. Following the election win, Sambanthan was appointed to the Cabinet and sworn in as Labour Minister in the Alliance government. Sambanthan did not accompany the delegation to London. He declared that he was confident the Tunku would be able to represent Malayan interests effectively in London. It was also a personal gesture of his confidence in Tunku’s leadership. Sambanthan was criticised for this decision by his party officials. Nevertheless, when the final constitutional negotiations were held in London in May 1957, Sambanthan was very involved. Sambanthan was a pragmatic negotiator and worked hard to secure the interests of the Indian community, while at the same time being sensitive to the broader interests of the Alliance party’s diverse membership. The final constitutional negotiations in London in May 1957 also saw a personal transformation in Sambanthan. While in London for the constitutional talks, Tunku decided that Sambanthan needed new attire. Thus when in London, Tunku decided that something must be done. As the Tunku describes in his book Looking Back: “When walking with me in London, he was always trailing behind because he could not step out far enough to keep pace with me; or perhaps I walked faster on purpose. One day when we were out for a walk, I led him into Simpson’s men’s store in Piccadilly. On reaching there, I said: ‘Come in; I want to choose a new suit’, so he followed me inside. During the debate on the draft Constitution at the Federal Legislative Council on July 10, 1957, Sambanthan urged greater co-operation between the communities, reminding them that Malaya was a plural society. He told the council: “We belong to a plural society, and we should always remember that in such a society we have to recognise that psychology has its own place. It is not enough if one’s own attitude towards a problem is good. Apart from ministerial duties, the Tunku often assigned important tasks to Sambanthan. He was a loyal member of Tunku’s Cabinet in the post-independence period. In 1968, the Tunku sent Sambanthan to Fiji as an emissary of peace; the Chief Minister of Fiji acknowledged Sambanthan’s contribution in a letter to Tunku thanking him for the “great success” of the delegation “under the superb leadership of Tun Sambanthan”. There is still a need for a more holistic appraisal of Sambanthan’s role in Malaysian politics, but there is very little doubt from historical evidence that he played a prominent role in the country’s independence movement. Dr Joseph M. Fernando is a Senior Lecturer at Universiti Malaya in Kuala Lumpur and author of The Making of the Malayan Constitution. Ms Ummadevi Suppiah is a teacher at SMK Assunta, Petaling Jaya. The Founding Fathers series is coordinated by Dr Fernando and Research Editor Dr Lee Kam Hing (leekh@thestar.com.my).